My husband's favorite cheesecake from The Cheesecake Factory is Dulce de Leche. 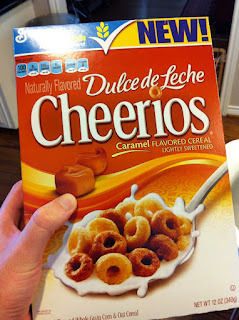 So when I saw dulce de leche Cheerios I thought I had to buy them for my husband! However, when I showed them to my husband he was less than thrilled. "Honey, that's weird. How does cheesecake translate to cereal."